M&S this morning unveiled its new-look website, shaped around its customers over the course of more than two years of testing. The site is built, for the first time, on its own platform (IBM WebSphere Commerce) instead of the Amazon platform it traded on for many years. M&S says today’s launch of its new-look desktop site that extends into the store and onto social media, is a milestone in its strategy to move from a traditional British retailer into an international, multichannel one. Alongside the new launch comes a dedicated tablet experience as well as updates to M&S’ mobile sites. M&S first announced it would move away from the Amazon platform in November 2010. 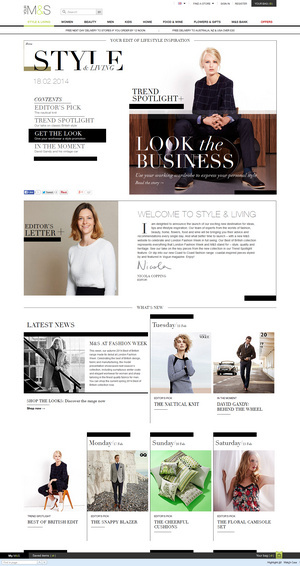 To deliver the site M&S used Sapient Nitro as a partner. The company has tapped into customer feedback and analytics, gathered over more than two years, to deliver targeted improvements. As a result, there’s now a search function that’s 14% more efficient, while images are boosted by up to 50% in size. There’s catwalk footage, maxi zoom and 360o video that all enable customers to see images more clearly, and there’s a Style & Living editorial hub with fashion content and lifestyle guidance from leading journalists and celebrity editors, whose features are shared daily with M&S’ two million social media followers. From its research, M&S found that about 40% of its customers shopped on the website for outfits, rather than a single item. It now aims to show half of its womenswear range as outfits through recommendations on the product page or through galleries that can be browsed by trend, occasion or as personalised recommendation. The new site also aims to enable customers to find what they want more quickly, via three-tier navigation and images that allow customers to recognise the items they want earlier in their journey through the site. The site also extends into the store; more than 40,000 employees, including 1,500 sales assistants armed with iPads, are using the platform, while there are also 120 browse and order hubs in store. 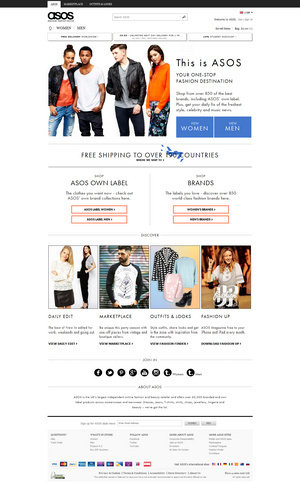 The site is initially being launched to M&S’ six million online customers. Bespoke content, email and social channels are all being used to highlight new features and changes to the site. That’s supported by more customer services staff and 24/7 social media. Late spring will see an external marketing campaign promote the new site. The new site is the latest part of M&S’ infrastructure to be updated in the light of multichannel. Its ecommerce distribution centre opened at Castle Donington in May 2013, building capacity ahead of peak trading season at Christmas 2014.